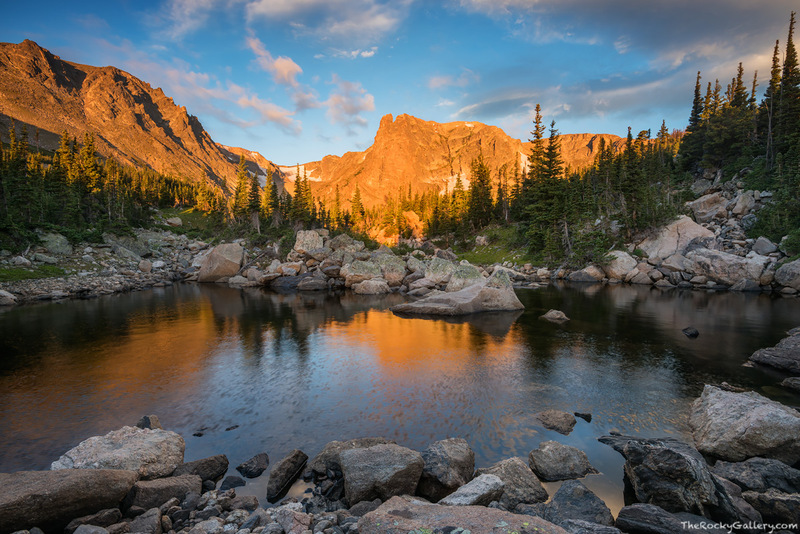 Backcountry scenes like this typify Rocky Mountain National Park. High and rugged granite peaks, clouds sailing overhead and a breeze rippling the surface of a small tarn. I made this image in the Marigold Pond area near Lake Helene after hiking in well before sunrise. Flattop Mountain and Notchtop Mountain catch the early morning light and the surface of the tarn is golden and blue reflecting their regal colors. In my humble opinion, you cant get much more 'Rocky' than this. Photo © copyright by Thomas Mangan.